This weekend in El Dorado Hills, California, family and loved ones bid farewell at a private mass for Annie Le, the 24-year-old Yale graduate student whose body was found hidden behind a wall in a university laboratory building: Private Mass pays tribute to slain Yale graduate student Annie Le. In a statement made to the media before the Mass, family pastor Monsignor James Kidder said the family hoped that the funeral would be "a chance for the family to come to reconciliation with something that is humanly irreconcilable: not only the fact that Annie died but the way she died." While a lab technician, Raymond Clark II, has been arrested and charged with killing her, authorities haven't offered much information about the her death, or a motive for the murder. Attorneys for Clark have asked the court to continue to keep his arrest warrant affidavit sealed from public view. But some grisly details have emerged. Described as fun and extremely bright, Le graduated at the top of her class at Union Mine High School in El Dorado in 2003. She was the school's valedictorian and was one of two students voted "Most Likely to Be the Next Einstein." She received nearly $160,000 in scholarship money to attend the University of Rochester, where she studied cell and developmental biology. At Yale, she was pursuing graduate study in pharmacology, studying the role of enzymes in disease and was on track to earn a doctorate in 2013. She was supposed to get married to Jonathan Widarsky two weeks ago, the day her body was discovered. 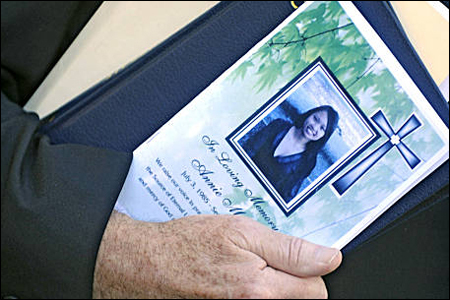 More on funeral here: Annie Le laid to rest.